Bio c'est in the bag! 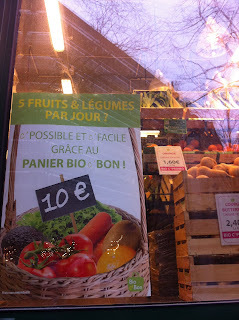 There is a wide variety of options for getting farm-to-front door veggie delivery in Paris. Between AMAP associations, paniers bio, websites like Paysans.fr, and the burgeoning La ruche qui dit oui movement, city dwellers have their choice of ways to get local, organic, farm grown foods on their dinner table. Those interested in participating in a weekly food delivery service may be overwhelmed by the available options. I know people who have tried, and been very satisifed with, the options listed above, but I myself have never signed up for any of these services. Maybe this is due to trepidation about my family of two being able to use all the produce that is typically included in these weekly deliveries, or maybe it is due to my fear of commiting to any subscription other than the New Yorker, but for whatever reason I prefer to do my shopping at open markets or my local biocoop. However, the recent opening of a Bio c'bon store in my neighborhood has brought me one step closer to being a panier bio buyer. Perfect for the non-commital types out there, Bio c'bon offers shopping bags full of fruits and vegetables that you can grab on your way home from work for only 10 euro. Another added bonus: on those days when you weren't planning on going shopping and didn't B.Y.O.B (bring your own bag) you don't have to worry- the bi bag is easy to grab and go, without having to stuff your shopping into your purse or pockets due to lack of foresight! This has become a Monday tradition in our house and I am starting to understand the thrill of getting a mixed bag full of seasonal organic produce. Bio c'bon has stores all over the city and every one of them offers the Bio Bag. The majority of the stores are also open on Sundays, so if you can't make it to the organic Marché Raspail , I highly recommend giving Bio c'bon and their bountiful paniers bio a try!